Hello, I recently purchased some of these robots. The mechanical assembly of these bots was pretty straight forward but my students and I are running into issues downloading the program into these bots as well as getting the WiFi program up an running. Are there ENGLISH instructions or videos on how to download the program in these bots. The Wikipedia article provided on your website was not helpful. I am trying to program these bots from a Windows 7 laptop. Please advise, Thanks! Let's work on one problem at a time. When you say downloading the program into these bots. Did you mean the Arduino code? You will have to forgive me: I am exploring new territory along with my students I believe it is Arduino---whatever code that tells the robot how to communicate with my PC thus enable it to run. We have successfully built the robots but we are unsure how to get them to run. can you please send link to the code that you try to download? As explained in the wiki, please download Arduino IDE from arduino.cc , and download the Arduino code in the wiki to the board. The board type is: The Arduino control board on the Rover is "Arduino Diecimila or Duemilanove W/Atmea168". Hi Jim, thank you. THat was a helpful start. I ran into more trouble after I installed the Arduino IDE. WIndows would not locate the driver for for the robot's USB cord . I tried searching for the driver--even dowloading "ArduinoUno.inf like another forum administrator suggested; it would not work (according to him, it is what I needed to have WIndows recognize my bot's USB cord). When I tried to use the Arduino IDE software despite this, it will fail to upload the program into the bot. Somthing to do with the Com port but the program will not let me configure a different "serial port" (it is greyed off). I know that I am missing somthing probably very simple for these bots; any help you can provide for programming these guys would be appreciated! From the wiki page FAQ, there is a CP2102 TTL to USB cable in the kit. Yes, we plugged in the cable but the cable is not the issue. 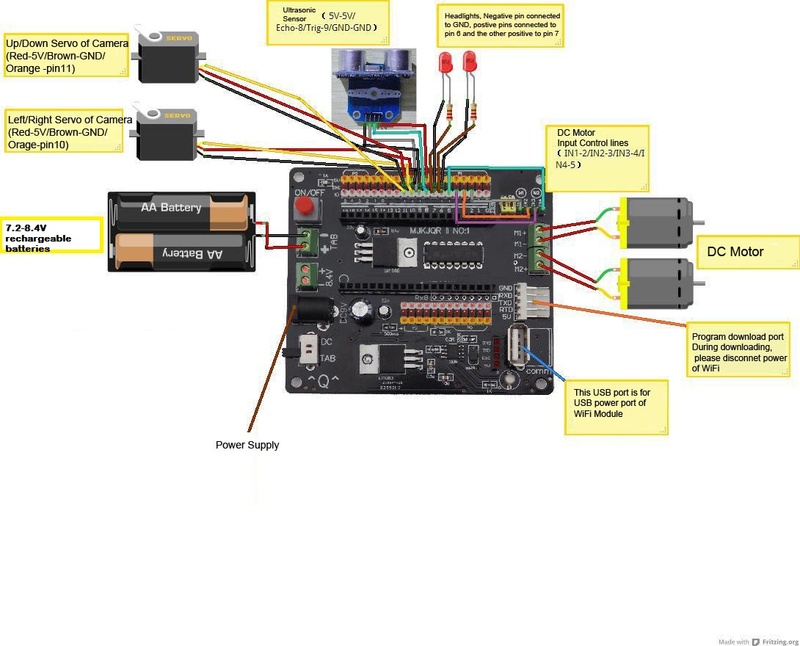 Here is step by step instruction to get your control board running. Step 1: Connect 5V power adapter to power socket of the control board. A blue LED lights up and a red LED in the right lower corner is blinking. Connect the control board to PC with the UART-USB cable. Step 2: You will see a small icon in the right lower corner of your windows. A red cross in the icon indicates that a driver is not installed. Do not use Windows Update to install the driver. It can find the Silocon Lab chip set but the driver cannot be found. Instead, download the driver from the link above https://www.silabs.com/products/mcu/Pages/USBtoUARTBridgeVCPDrivers.aspx. Choose the driver for Windows 7. Download it and unzip it into a directory. Step 3: Click on Start in your windows. Choose Control Panel/System/Device Manage. Find the Silicon Lab CP210x USB to UART bridge under Ports. Click on it then click on Update Driver. Find the drive you just downloaded and unzipped, and install it. The small icon with red cross will be gone, which means that the device is ready to use. Step 4: Download Arduino IDE 1.0.6 from Arduino website. Install it and the USB driver. Step 5: Download the Arduino Demo code at https://s3.amazonaws.com/linksprite/robot/Rover+English/RoverBot_Arduino_Sample_Code.ino. Step 6: Open the Arduino code by clicking Open the find the downloaded file. When IDE says you need to create a project with whatever name, click OK. Step 7: Click on Tools/Board, select Arduino Diecimila or Duemilanove W/Atmea168. Then click on Tools/Port, select the port that the UART-USB cable is inserted into. Click on the toolbar with a right thick arrow inside. Your Arduino code is complied and uploaded into the Control board. When successful, you will see message in the bottom status window. Up to this point, your control board is working. I just tested it, and it worked just fine. Upload sucessful. Thank You David. Now How do I configure the rover to work with the PC control software (AKA stream video from the rover's webcam & control it over the wifi). We need to start over with assembling the Rover. will update soon. Already finished assembling the mechnics. But I need to buy some tool. Will continue working on it at the weekend. The tutorial will take a while. Ok. I look forward to closing this project. thank you. Great news! I just finished the project and made everything work (except there are some Chinese in the tutorial or software). Here is the tutorial http://www.linksprite.com/wp-content/uploads/2015/02/rover-assembling-instruction.pdf. Hope you can make your Rover running as well. Thank You for assembling the instruction guide David! Following your directions, I was able to install the USB driver for the bot, upload the "Arduino sample code" from the link on the Linksprite Website, install the PC software, enter the ip address in settings & stream the video from my robot to the Linksprite Softtware provided. However I am still unable to send commands to the robot (aka get anything to move using the PC software). Am I missing a step? Did I upload the wrong code using the IDE software? I can see the light at the end of tunnel! Please assist! First of all, check all the soldering and wiring very carefully and make sure they are correct. Then check the command settings in the software, and make sure they are matching in the Arduino code and the PC software. I see you can stream video from Rover to PC. That is good milestone. It is very close. Keep clicking on the servo commands (Up/Down/Left/Right), can you move the camera? Use your mouse to click on the commands (instead of using keyboard) and see if the Rover is running. The camera will not move on two of my robots nor the wheels. Tomorrow I will try the other bots. I there anything besides soldering that I could be missing and need to check? The wikipedia article mentioned Open WRT? Did you get the camera or wheels to move in any of your Rover? Send me high quality picture of the wiring if you want me to check for you. I recently bought the rover kit. It is all assembled. Arduino sample codes are uploaded. PC software downloaded. Wireless network for robot connected to pc. I copied the pdf in wifi settings for the IP address, however , I am getting "An invalid IP address was specified" pop out whenever up,down,left,right, etc is selected. No video either. Can you advise on what to do? Please take a picture of your setting window and post it here.